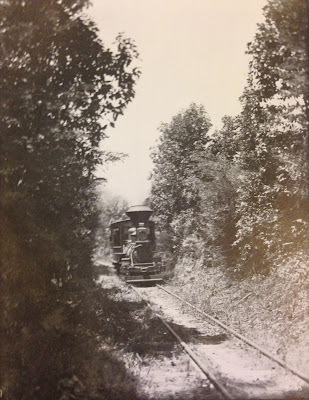 While the Dougherty Extension Railroad was built to service the Dougherty brothers' mill up at Riverside Grove, its passage through the property of James F. Cunningham, in whose firm the Doughertys were partners, could not be missed. Lt. Cunningham was a Canadian from New Brunswick who served in the 15th Main Infantry during the Civil War. For five years after the war, he travelled around the East Coast before finally moving to California in 1869. After going bankrupt in San Francisco the next year, he restarted his life on a homestead on Fall Creek where he became a lumberman. Within months he had earned enough money to open a general store in Felton. In 1878, he sold his store and opened a new one while also expanding his milling operations in the valley. By 1885, he had moved to Boulder Creek where his mill operated two miles north of town. His property, named the Cunningham & Company Mill, was built along the San Lorenzo Flume & Transportation Company flume grade. The Cunningham Mill's history with the South Pacific Coast Railroad began in 1885. In that year, the railroad began service to Boulder Creek. The Dougherty brothers almost immediately began construction on a line that would extend to their mill four miles north of town, passing through Cunningham's mill in the process. The Dougherty Extension Railroad, therefore, connected the mill directly via rail to Boulder Creek and the rest of the United States. On a regular basis, up to five carloads of milled lumber would be shipped to Santa Cruz via the Cunningham & Company Mill. 1892 Sanborn Fire Insurance survey map of the Cunningham & Co. planing mill facility in Santa Cruz near the depot. 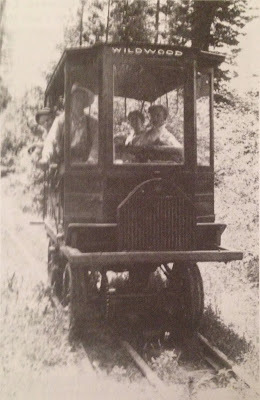 The "Dinky" on the Wildwood Railroad in 1915. Edward Sanford Harrison notes in his History of Santa Cruz County, California (1892) that the mill had a capacity of milling 40,000 board feet of lumber per day. In addition, the company milled 12 million shingles a year. This mill was connected with a planing mill in Santa Cruz that also produced building materials and furniture, some of which was then sold at Henry L. Middleton's store in Boulder Creek. Indeed, Middleton's store (also known as Doughertys') was originally constructed by Cunningham and later sold to the Doughertys. The mill was managed by James and his brother J.W. Cunningham, although Middleton and James Dougherty were also frequent partners in the operation. In 1890, Cunningham retired from working his mill and moved to Santa Cruz, with the property likely passing to the Santa Clara Valley Mill & Lumber Company owned by the Doughertys. J.W. Cunningham may have continued to run the mill for the Doughertys for another few years as a Sanborn Fire Insurance map in 1892 still shows the Santa Cruz properties operating under the family's name. Logging was likely on the decline in the immediate are since operations had been a continuous process in the area since at least the 1870s. James Cunningham died on 23 November 1907. J.W. later came on as general superintendent of the S.C.V.M.&L.C. from 1901. There is no mention of the Cunningham Mill after 1892. While the Cunningham Mill served as a stop on the Dougherty Extension line from 1887 until at least 1890, it was not a general-use passenger stop and only people related to the logging operations regularly traveled on the line. when the Dinky wasn't required. It's brief stint as a passenger stop began in April 1914 when the stop adopted the name Wildwood No. 1, the precursor to the Wildwood subdivision. The route was leased from the California Timber Company by a development firm in Oakland to sell properties at the former mill sites. The engine that operated this line was the "Dinky", originally the "Felton" of the Santa Cruz & Felton Railroad of 1875 and by now the oldest continuously operating engine in Santa Cruz history. Rick Hamman states that the realtor, E.S. Cheney, "would wine and dine and soft-sell property to...interested parties. Lots went of the unbelievable price of $125.00 each, and houses were a mere $250.00 to $600.00, depending on what conveniences were desires." By June 1915, buses replaced railroad transport to Wildwood and the line sat unused until it was finally removed in 1917 to provide steel for World War I. The subdivision still remains at Wildwood, though I daresay it looks much different than it did when Cheney sold the properties in 1915. Few of the properties sold or were developed and the region remains sparsely settled. Of the railroad, little is left. Even the precise location of the mill is up for debate, though the right-of-way was likely River Road, implying that the railroad crossed the San Lorenzo River near Pleasant Way. Wildwood Road and Wildrose Terrace are likely the heart of the original subdivision, though it eventually spread southward and across the river. Rick Hamman, California Central Coast Railways (Santa Cruz, CA: Otter B Books, 2002). Edward Sanford Harrison, History of Santa Cruz County, California (Santa Cruz, CA: 1892). Robert L. Nelson, Old Soldiers: Santa Cruz Civil War Veterans (Santa Cruz, CA: Public Libraries).